I got so incredibly busy (and sick multiple times) in April, I felt lucky if I even got to sit at my machine and sew one seam. And as it turns out, I (sadly) didn’t finish everything I set out to do in April. I did finish my 40’s skirt in a cream linen, but have yet to have my husband help mark the hem. I hope to do that over the weekend and post an April recap next week. I’ve had circle skirts on my mind for quite some time now. 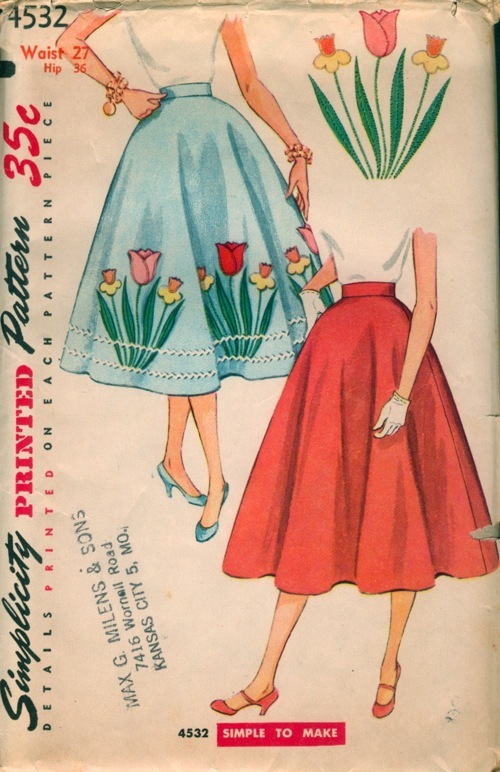 I’ve never made one before, but already I have a whole slew of circle skirt applique ideas floating around in my head. So this May I’m planning on making 2 of these fun little skirts of my own design using this pattern (which is actually a 1/2 circle skirt pattern). I’m using a 1/2 circle skirt pattern because I think with my general shortness this will end up being enough flare for me and the full circle skirt may end up overwhelming me. The first is going to be a scalloped skirt design like I’ve drawn out in the upper right. Ahh well, it gets my ideas out on paper, and I’m sure they’ll look better made up. This will be the first time I’m sewing up scallops and I’m also drafting them out too. So it should be good fun. I’m making the outter in pink linen and it’ll have a cream colored linen under skirt. My picture isn’t quite as scallop-y as I hoped, but it will have that effect. I think I’m leaving off the bows since I think it might be too much. I’m going to make a large umbrella applique and I’m going to sew on some raindrops above it coming down. I’m still not certain what effect I want to use for rain, but I’m sure it will come to me in due time. I was thinking some blue circular rhinestones I have, or perhaps little bits of chiffon to give the skirt some depth and texture. I should also note that I’ve never done applique before, either. But I’m sure its not too terribly hard to do…. In general, I’ve always picked patterns that have interesting design elements (pleats, gathers, pretty necklines) or if the pattern was on the plainer side, I’d pick a busier fabric to complement it with. And I’ve been wanting to change this idea for some time now. I’ve rarely used trimmings, like lace or piping, in order to further enhance a pattern but I feel like now is as good a time as any to start incorporating some “fun” into my sewing. Looks familiar right? I was so focused on the skirt pattern, I’ve overlooked the top. But the more I’ve been working on the skirt, the more I’d been admiring the blouse paired along with it. I’m planning on making this blouse in a white cotton of some sort, so that it can be worn with either of the two circle skirts. Also if you’ve made some circle skirts yourself, feel free to put your links in the comments section. I’d love to see what you have all done. Thanks for Casey’s link also. I follow her blog, but I forgot about her post about them. I really am not even sure I know exactly what a half circle skirt is, other than to say I am with you on the short part and circle skirt being slightly overwhelming part. I have a couple and when I see photos of myself in them, I always feel I look a bit like an Oompa Loompa. Hey, I noted your knitting column on that sketch, too. ;) I wish I had better drawing skills (read: ANY drawing skills) as I’m embarrassed by my pathetic attempts to render things on paper. From my understanding, the half circle skirt uses less fabric than a full circle skirt, so it’s just not quite as full as the traditional circle skirt. Here’s a drawn picture of the two skirts. But for the full-circle skirt, you cut two of them on the fold but the 1/2-skirt you only cut one on the fold. Here’s a good thread I found about the difference between them also.